Two kittens that stopped NYC subway service rescued - Miata Turbo Forum - Boost cars, acquire cats. 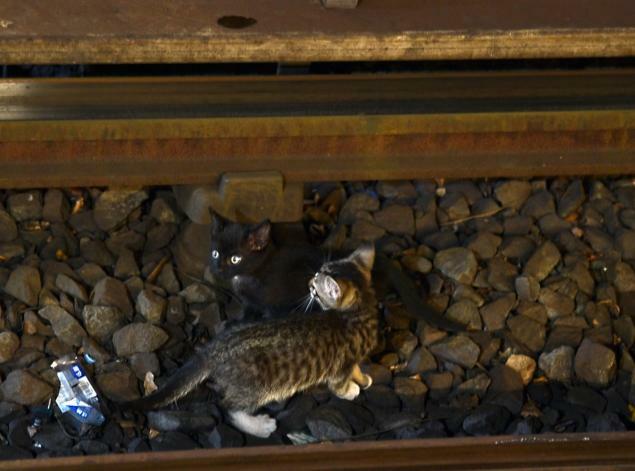 NEW YORK -- It only took two kittens to stop the city's subway in its tracks. Power was cut to the B and Q lines in Brooklyn for more than an hour after a woman reported Thursday morning that her kittens were loose in the nation's largest subway system, transit officials said. The furry felines, one black and the other white with gray stripes, were finally found on the tracks and rescued about seven hours later. How they got there was a mystery. But they were seen running dangerously close to the high-voltage third rail. 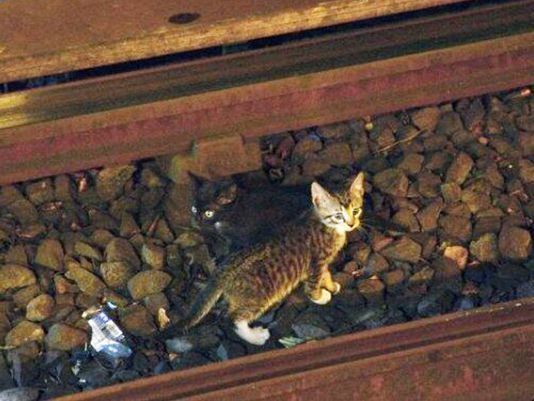 Their owner rushed to a subway station with cat food for transit workers dispatched onto the tracks to use to try to corral them. Power was suspended between several stops – about half the Q line and the B line's entire service in Brooklyn – on the local and express tracks for 90 minutes, Metropolitan Transportation Authority spokeswoman Judie Glave said. The express line was stopped another half-hour while workers kept searching. But the skittish kittens disappeared again before being discovered Thursday evening under the third rail of an above-ground express track. Police officers removed the kittens in crates, Glave said. Officials said workers and passengers in Brooklyn's Flatbush neighborhood had been on the lookout for the kittens and train operators were asked to proceed with caution. If they saw anything moving on the tracks, they were required to stop and notify the rail control center. Some passengers wanted to help by scouring the tracks but were turned down by MTA workers citing safety concerns. While the effort on behalf of the kittens created delays for passengers, the Q operated a shuttle service between two of its normal Brooklyn stops, said transit officials, who couldn't immediately provide the cost of the extra service. The phrase "High Voltage" is properly used to describe voltages in excess of 1Kv (RMS) AC, or 1.5 Kv DC, which are typically found in overhead power-transmission and distribution lines. The third-rail in the New York MTA system operates at 600 V DC, and is thus not a high-voltage system. Yes, 600 volts will very easily kill you (and would probably cause a kitten to literally explode), but please, try to get the terminology right when authoring news articles. Last edited by Joe Perez; 08-30-2013 at 11:54 AM. There is hope for this world. My faith in humanity has been restored a little bit. That story was literally heartwarming and literally deserved its own thread.